Nothing to lose, everything to win! The IECU Save to Win CD incorporates all the thrills of the lottery with none of the risk! Earn a chance to win up to $5,000 with every $25 deposit you make into an IECU Save to Win CD! It’s a special savings account at IECU that helps you build your savings while also giving you chances to win $5,000 quarterly prizes, plus monthly cash prizes! 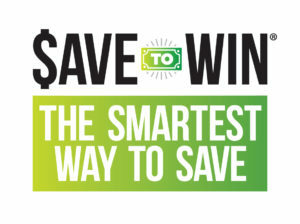 Every time you save $25 in a Save to Win account, you get another chance to win-up to 10 chances every month. Plus, all the money you deposit into the Save to Win account is still yours, plus dividends. It’s savings-with benefits! What Exactly is a CD (Or Share Certificate)? A share certificate is a fixed-rate, fixed-term account issued by IECU. You will earn a specified dividend (0.60% APR*) if the certificate is held for the full term, 12 months in this case. You are allowed one withdrawal from your Save to Win account in the 12-month period for a $25 withdrawal fee. The real prize is the savings account you will build with regular deposits each month. But to sweeten the pot, thousands of monthly prizes and several quarterly prizes up to $5,000 will be awarded throughout the year. Prizes will be deposited into the winners’ traditional share account. Official account and prize entry rules and a complete list of prizes are available here. For a complete list of IECU winners, please click here. Each month, we’ll look at your current Save to Win balance as compared to the previous month’s balance. You’ll receive one entry for every $25 increase. For example, if your Save to Win balance increases by $50, you’ll receive two prize entries for the month. Those entries will also be added into the quarterly prize drawing, giving you additional chances to take home a prize! You seriously have nothing to lose-any everything to win! Not everyone will win a prize, but with regular deposits into your Save to Win account all year, you are guaranteed to end up with more money than when you started. Can I Withdrawal Money From my Save to Win CD? It’s easy- just let us know that you’re ready to start saving, and hopefully WINNING! All we will need is a quick signature (online or in-person) and your $25 initial deposit. As you continue to make additional deposits, you will accumulate more entries into the drawings. To participate, you must be at least 18 and a legal resident of Illinois. *APR=Annual Percentage Rate. Rates, terms, and conditions vary based on qualifications and collateral and are subject to change without notice.